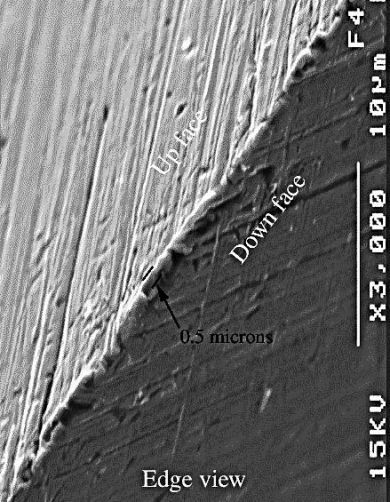 magnified SEM Picture from prof. John D. Verhoeven's "Experiments on Knife Sharpening"
Shows how small burr-like structures are randomly located at the very tip of the edge. SEM picture from Prof. John D. Verhoeven's "Experiments on Knife Sharpening"
Stropping a razor on a clean leather strap remains one of the most scientifically uncharted territories of the sharpening proces. In his - among sharpening adepts famous - knife sharpening experiments, Professor John D. Verhoeven of the Iowa State University ventured into some sideways research on stropping, but he could not reach much conclusive insights into the bare physics of stropping a knife's edge on leather that was not treated with any abrasive compound. Even though he inspected the edges with a Scanning Electron Microscope (SEM), he reported little to no evidence of physics at work. One could be inclined to start wondering whether stropping has any measurable effect at all. Yet, any experienced straight razor shaver will testify that the difference between a regularly stropped and an unstropped edge is very conspicuous. But even for those who like to attribute this to the mother of all placebo effects, it's impossible to dismiss the very clear improvement that can be found post stropping, in the way a single free hanging hair can be severed at any distance of the holding point. In short: while we can collect empirical evidence of stropping efficiency, we cannot witness the bare physics at work. That leaves us wit a lot of speculation. In that light, this article does not claim hard scientific truth, nor does it claim that the proposed methods are the only ones that work. It only tries to offer a logical hypothesis and formulate procedures that work, based on a plausible theory. I can testify that I have excellent and highly repeatable results from the application of these principles. One can not address the basic concept of stropping a razor, without understanding few basic principles of sharpening. An edge is the intersection of two planes. The cleaner this intersection, the keener the resulting edge. When sharpening with solid whetstones, we aim to make those planes as geometrically even as possible. This being a reliable away to assure a very clean intersection. The main force at work during this part of the process is abrasion. All steel that extends beyond the desired shape is patiently abraded away. Near the completion of this task, it's important to reduce the depth of the abrasion, either by using a finer sharpening stone, or by reducing the depth of cut. At this stage another possibility appears at the sharpening horizon. A second principle capable of altering the surface of a steel plane: plastic flow. While a few readers may think this is some kind of ghost out of a bottle, it is in fact a well known principle among metallurgical scientists and engineers. Plastic flow is closely related to plastic deformation. Plastic deformation is what allows steel to be bend and rolled. On a much smaller scale it also allows minute alterations of he peaks an valleys that form the scratch pattern left by abrasion. This malleability on molecular scale is called "plastic flow". In the technology of metal surface conditioning, several processes are utilized that involve plastic flow: polishing, burnishing and buffing are all marked by different ratios between abrasive and plastic forces. 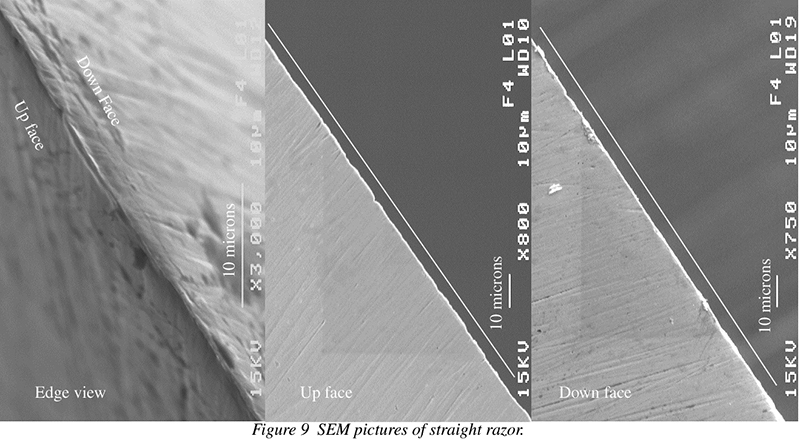 At the final stages of razor sharpening, when the width of the intersection between both planes is less than 0.5 micron, plastic flow is with certainty playing along in the process. The relation between both entities depends most likely on the nature of the whetstone or the honing compound in use. Hard particles, such as diamonds, offer mostly abrasion, while softer minerals such as chromium oxide bring plastic flow into the equation. In the absence of evidence that a clean leather strop has any significant abrasive influence on steel, the logic conclusion must be that it relies predominantly on plastic flow to achieve the observed results. I have only circumstantial evidence to sustain that claim, because I have no means to monitor the effects directly. As already stated, Professor Verhoeven wasn't able to reveal any traces of abrasion by stropping on clean leather. The absence of black residue on a well used strop supports that claim. Neither does the organic origin of leather, which offers no reason to expect the presence of hard molecular structures, as they are often found in matter of mineral origin. That leaves only plastic flow as a valid candidate to cause the assets of stropping on clean leather. But why would we need such a thing? As mentioned above, an adequate sharpening process aims at defining the keenest possible intersection between both planes of a cutting edge. But even so, this intersection has its thickness, which can be seen as a ultra narrow strip of steel still undefined, typically approximating 0.5 micron on a razor. There's an old term in the field of razor sharpening, that has been subject to some controversy in recent times. Our ancestors called the very apex of a razor's edge "the fin". They claimed to strop in order to (re)align "the fin". I think they were not far from the truth. If we look at a SEM-picture - that I borowed from Verhoeven's study - of the rim on top of the edge, we can see it is occupied by small bur-like structures. These are not true burs, because they do not extent beyond the margins of the tip. It's best to think of them as burs in embryonic state. It are these structure that we will attempt to fold into the same direction, by application of stropping action. When we're succesful at doing so, we will experience a clear improvement of the performance of the edge, albeit this is not a long lasting vantage. This extremely thin portion of the edge easily looses its alignment during impact with beard hairs while shaving. For this reason, stropping needs to be repeated at least every few shaves, and ideally every shave. Iowa State University, pages 2 and 3) are formed. These cannot be just wiped off with a paper towel. The formation of these debris deposits is the major reason why we hone with an edge leading stroke. Sharpening with the edge trailing delivers the deposits right where we don't want them, namely: at the very edge itself. A honing stroke with the edge leading prevents this as much as possible, but not entirely. A good linen strop exerts a minor abrasion to reduce this debris without adding much on its own. It is clear that the linen component won't gather all this dirt endlessly. It needs periodic cleaning. I do this about once a year, or whenever the fabric looks really grimy. The procedure is as follows: separate the linen from the leather, or - when that's not possible - wrap the leather in cling film and place a towel or a cloth between the linen and the leather. Take a puck of soap (a shave puck works fine) and a stiff brush. Moisten the brush, run it over the soap, and rub the surface of the linen with the brush. A thick foam should be vigorously rubbed into the fabric. Let this set for a few minutes. Next remove as much of the soap as possible with paper towels. The fabric should look much cleaner now. Repeat the entire procedure and allow the linen to dry overnight. Use a vacuum cleaner to remove the dried soap dust out of the fabric. Your linen strop will look like new. Once again: take every precaution to avoid staining the leather component. The technique for stropping on the linen surface is the same as for the leather surface. We will address it in detail at that paragraph. I recommend the Dovo "Russian Juchten Leather" strops. They have leather with excellent stropping properties and the linen (the one with the V-weave pattern) is among the best I've come across. But most importantly: they're affordable. You're bound to nick the strop during the first year of gaining experience. This is completely normal and to be accepted. You'll learn to avoid such little mishaps eventually. At which point you can treat yourself to a genuine piece of leather and linen artwork, to be cherished the rest of your life. Maybe one in Donkey leather. I'd fancy that. :-) But I bet you'll secretly still like your battered old Dovo. Superficial nicks can be sanded out with 180 grit sandpaper. I'm not overly fond of pumice for this purpose. Pumice leaves a very fine abrasive dust (it's an ingredient in some types of compound for metal polishing), you don't want to end up with a partially "pasted" strop. If your stropping calamity caused a small loose flap, it can be glued in place with a few drops of CA-glue. Immediately wipe off excess glue, and sand everything flush once cured. Stropping lends its efficacy from friction. We'll discuss this in detail in the paragraph that addresses the stropping stroke, but the surface condition is a big contributing factor to the friction exerted on the edge. The amount of grip the leather has on steel determines how easily you can manage to get that friction going, while keeping pressure within reasonable range. If the leather is too slick, it'll require so much pressure that you might both deflect the strop and the blade. Strop deflection can be counteracted by pulling harder on the strop, but it'll remain awkward, and we have no solution for blade deflection. So far, I've always found the most agreeable draw on leather that had a slightly raised grain, typically found on Nubuck-like finishes. (I'm talking about the texture, not necessarily about the actual process). There are ways to influence draw of a leather surface. I advice caution with oil or fat for that purpose. Depending on climate and the inherent properties of the particular leather, they can be useful, once a a year or so - sparingly-, to condition the leather. Though regular rubbing with the palm of your hand easily keeps a strop in peak condition. The natural lipids that keep the skin of our palms supple, beats every imagineable oil in a bottle, ànd it comes for free. A strop that demands the application of massive amounts of greasy sustances, in order to develop any significant draw, is just not a very good strop. The idea is to strop on leather and not on a coat of fat. A strop that originally had a velvety draw will become burnished over time, by the steel passing over it. Rather than making the surface sticky with some saddle fat, it's much better to mist it with a spray bottle. That's right: plain ol' water. It raises the grain of the leather ever so slightly and does more to reinstate the original velvety surface than besmearing it with grease. If my realignment theory is correct - which I think it is -, it makes no sense whatsoever to do extra laps, or to use a progression from a "rougher" to a "finer" leather strop. An ironed shirt can't be improved by more ironing. The same counts for an aligned edge. A statement that might unsettle people who cherish more than one strop, yet to my knowledge thus far, not one single claim about the virtues of a multiple strop progression has been able to survive a blind test. Those of us who ever attempted to iron a shirt know for fact: it takes practice. Skilled stropping is no different. The only aspect that truly matters is to make sure that the razor travels correctly over the strop. How one manages to perform such a stroke is of no further consequence. If you're already know how to strop and get good results, that's fine. No need to change a thing. But if stropping is a new concept to you, I warmly recommend the technique described below. It's derived from tradition, helps to avoid most pitfalls, and uses a few techniques you can put into equal advantage while honing your razor. Fold the razor open 180 degrees. Hold it in your dominant hand, the palm facing down, the scales loosely resting on your pinky, ring and middle fingers. (This is demonstrated in the video) You should be able to open your thumb and index finger, without any risk that the razor might drop. Grab the tang between thumb and index finger and flip the razor, as if you were adjusting a small volume knob on a transistor radio. You should NOT use any wrist movement. Practice on the linen strop first, as you'll be less likely to cut into it. Place the razor on the strop, near the end where you're holding it. The edge is facing you. Pull the strop reasonably taut, without fatiguing yourself too much. Guide the razor away from you, all the way to the far end. Focus on the spine. The edge will follow. Don't worry about pressure and draw just yet. Go lightly. There will be some deflection in the strop, which is fine, as long as the strop deflects mainly at the spine and not so much at the edge. When you arrive at the far end, use the volume knob twist to flip the razor over the spine. Look at the spine as the rotational axis of the razor and keep it in touch with the strop *at all times*. You must think of stropping as of dragging a spine over the strop. The edge is just something that follows along. When the spine arrives back at your end, flip the razor once again, and you're back where you started. Unlike a sharpening stone, a strop has enough flexibility to make good contact with a razor's edge, regardless that razor might be slightly out of true or the edge is carrying a smiling curve. Hence there is no real need for an X-stroke. There are no microscopical teeth to be aligned in the a diagonal direction, which is a stubborn myth. Even so, your strop might lack the width to support the full length of the razor. That can be overcome by stropping X-style, or even diagonally, but I personally prefer to strop partially, meaning that I start stropping a number of strokes with the heel in constant contact, after which I gradually move over the middle to the toe, and stay there for an equal number of strokes. I personally do not care much for 7.5cm (3") wide strops. At that width there is more tendency in the leather to cup, although a quality strop will not cup or twist, no matter the width of the strap. But I find them a bit bulky, they're more expensive, and if one possesses the skills for adept stropping, strop width becomes a total non-issue. The extra cost is better spend on a higher quality strop than on a wider one. As documented above, friction is important. The scientific formula to describe the concept of friction uses 3 important variables: The fist being the adhesion of the two objects rubbing together. It is obvious the steel of the razor can't be altered in that respect. The surface of the strop can be influenced within a narrow margin. It's good practice to kindle it a bit by rubbing it with the palm of the hand. As already mentioned, the natural oils of the skin keep the strop in condition, the rubbing pre-heats he leather (those who play billiards know that a few temperature degrees can have on a very obvious influence on friction). It also keeps the leather supple. Yet our two remaining variables are really key when it comes to the desired friction. The first is pressure. The second is speed. Too much pressure should be avoided. It not only tends to bend the strop too much, but it deflects the razor, and it will do that at its most pliable part: the edge. That is one of he reasons to favor a strop that exerts some draw of its own. If the strop is so slick that we need to get all draw from applying pressure, the results will be mediocre at best. A good strop will invite you to apply a gentle pressure. Enough to feel the friction as a slight resistance that needs to be overcome while the steel travels over the leather. It will be different on each strop. If you feel the friction, it's there. That is all it takes. If you need to push down real hard to feel any friction, then you're in trouble. The final variable is speed. You need some speed. Not much, but some. Speeds brings kinetic energy into the equation. It's the same kind of energy that makes a blow with a hammer so much more efficient than an attempt to merely push a nail into the wall with equal force. If you move a razor at snail speed over a clean leather strop, nothing will happen. You can flip the razor as slowly and focused as you like, the stroke itself requires some speed. How much speed? Well, just pay attention next time your wife or mother wipes a grain of dust off your tuxedo. It's impossible to give solid numbers, as it depends on the properties of the strop and how efficient you can manage to make use of it. Yet I will share the stroke counts that work for me. 1. regular, daily edge preparation before the leather strop. 20 round-trip laps should be more than enough. Depends a bit on the finishing hone and metod used. 60 round-trip laps are usually sufficient. The leather strop (re)aligns the rim (or "fin" - if you wish -). As mentioned, once aligned, there's no further effect of additional stropping. 60 laps is probably more than necessary, but it's what I do. It gives the lather on my beard some time to soften the hairs, it's a relaxing activity and it keeps my stropping skills well practiced. In the video fragment, you can see me demonstrating how to hold the razor and how it can be flipped without turning the wrist. I've also demonstrated the stropping stroke, slow at first for tutorial sake. Finally at a comfortable speed, that should be attainable for all, after some practice. I am standing a bit far behind the strop, as I needed to avoid blocking the camera. Normally I hold the strop close to my waist, so that my arm doesn't have to stretch out as far as you see me doing for this video. I've tried to shoot footage at a enough different viewing angles to show all details of the motions involved.